Nothing says autumn quite like gathering around a roaring campfire with friends on a cool, crisp evening. Grab a few soft blankets to keep warm, pour mugs of hot chocolate or steaming apple cider to up the cozy vibes, and then take turns sharing your scariest ghost stories – what could be more perfect on an October night? With hundreds of years of history, Yellowstone National Park is no stranger to ghost stories. But are they fact or fiction? You’ll just have to visit for yourself to know for sure! In the meantime, if you’re looking for a spooky tale to share around a campfire, here are some of Yellowstone’s most infamous ghost stories, guaranteed to make your skin crawl! The legend of Yellowstone’s most notorious ghost begins in 1915, in New York, when the teenage daughter of a wealthy shipping company owner rejected her arranged marriage. She had fallen in love with a much older man who worked in their house as a servant and wanted to marry him instead. Despite her father’s attempts to talk her out of the union, the heiress married the servant. Heartbroken, her father offered the couple a significant dowry as a wedding gift – on the condition that they would leave New York forever. To his surprise, they agreed. The pair traveled to Yellowstone for their honeymoon, which is when things began to go south. The couple booked a room at the Old Faithful Inn and it didn’t take long for the new bride to see the error in her judgement. Her husband spent their dowry playing poker and eating and drinking in excess, and one month into their honeymoon trip, they ran out of money. The bride telephoned her father to ask for more money, but he denied her request. One night, hotel staff allegedly heard the couple arguing loudly, and the husband eventually slammed out of the room, never to be seen again. After keeping their distance for a couple of days, the staff began to worry about the new bride and went into her room to check on her. An unlucky hotel maid found the bride in the bathroom, bloody and missing her head. Staff searched high and low, but her head wasn’t located for days, until it was discovered in the Crow’s Nest, where the band played. Since then, guests have reported seeing a form in what appears to be a white dress descending from the Crow’s Nest with her head tucked under her arm. Getting chills? Don’t worry – Yellowstone’s interpretive specialist Leslie Quinn reassures us that this story is 100% made up! 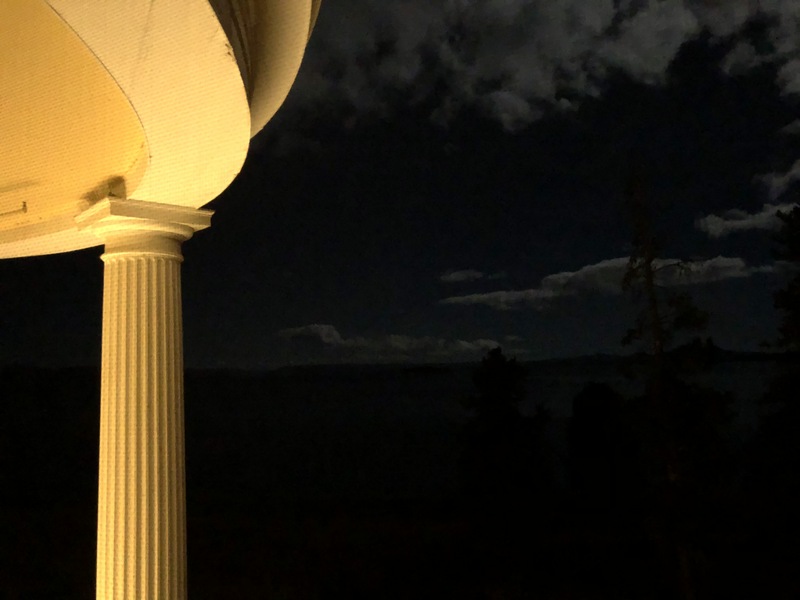 We think ghosts would prefer to drag their chains around large, historic, older hotels, such as Old Faithful Inn (opened in 1904), Lake Yellowstone Hotel (opened in 1891), and Mammoth Hot Springs Hotel (opened in 1937). Years ago, a woman staying at the Old Faithful Inn is rumored to have seen a woman dressed in late-1800s attire floating at the foot of the bed during the night. The story goes that the next day her husband showed the hotel’s activities agent the claw marks on his shoulder from his frightened wife’s fingernails. Fact or fiction? 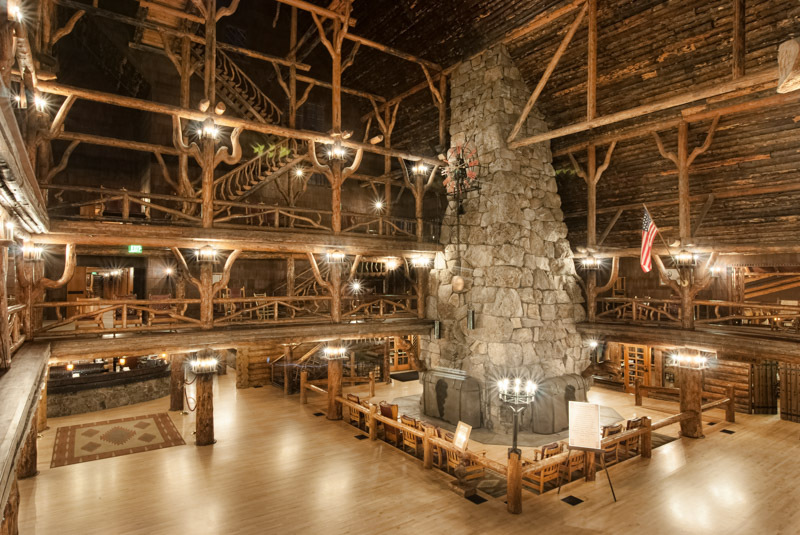 Book a stay at the Old Faithful Inn and see for yourself! There’s something to be said for a workplace with low employee turnover, but the stories about staff who stick around at Yellowstone forever seem a bit far-fetched! Some park staff have mentioned a lead porter who is still working at the Lake Yellowstone Hotel in spirit form. Dressed in early 1900s clothing, he’s been rumored to appear and offer to help people who are having trouble getting their luggage to the second floor. Apparently, he also provides tips on trails to explore in Yellowstone. Who doesn’t love a helpful haunter? Whether or not you believe in ghosts, Yellowstone National Park welcomes you! History, nature, wildlife, adventure: you’ll find it all here in America’s first national park. Want to experience Yellowstone in depth? See what makes Yellowstone National Park a great place to work for a season or longer!